WILMINGTON, N.C. – Cape Fear Museum is proud to announce the award of a $3,600 grant from the Landfall Foundation. Funds will be used to purchase nature-related play materials and create new science, technology, engineering and math (STEM) based family programs in the New Hanover County Cape Fear Museum Park. “We are grateful for the generosity of Landfall Foundation in providing support to expand learning opportunities for families visiting our park,” says Museum Director Sheryl Mays. “These new programs and companion materials will encourage families to discover STEM in their everyday lives, use it to solve problems, and have fun outside.” Programs will be offered during spring break and school holidays. Cape Fear Museum Park is an urban green space, free and accessible to the community. Its interconnected park-like landscape and interactive exhibits introduce visitors to some of the ways that people have interacted with the region’s land and water resources through time and how these interactions have shaped the history of the Lower Cape Fear region. Visitors to the park can engage with hands-on exhibits, explore gardens featuring native and adaptive plants, learn about historic objects and images, and enjoy special educational activities. 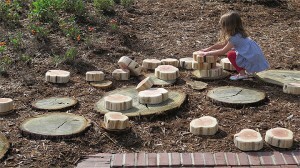 The park’s design encourages physical activity and learning through discovery, observation and play. The Landfall Foundation was formed to support greater Wilmington area non-profit organizations. Since its inception in September of 1995, the foundation has raised and contributed almost $3,400,000 to Wilmington non-profit organizations. In 2015, the Landfall Foundation presented checks to 78 Wilmington area non-profit organizations totaling $361,000.